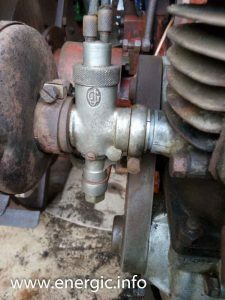 The Energic motoculteur brand used different types of carburetor from different manufacturers depending upon the engine size and the demands of the engine on motoculteurs. 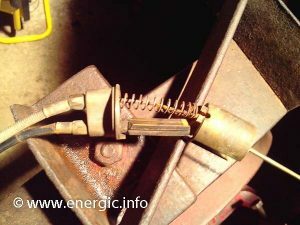 Also the specification was changed depending upon age, original equipment or replacement part. This is a quite complicated area. 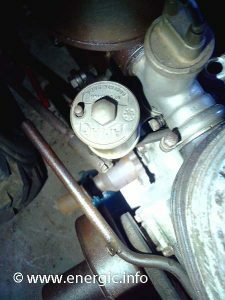 Because the engines where motobecane and therefore shared the same parts and auxiliary components i.e. the carburetor. A lot of these carburetor where salvaged by motor cycle enthusiasts as the motoculteurs where put up for sale or scraped in the past 80+ years. 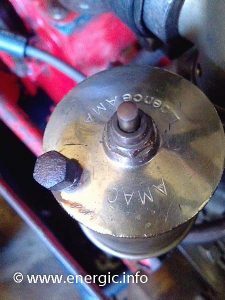 It is difficult to find these carburetor in-tacked and in working order. 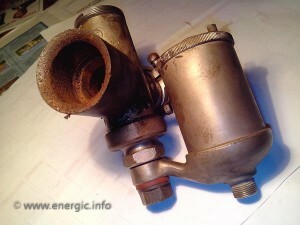 Initially the Energic motoculteur B1 with a 247cc engine used a Gurtner marked GJ carburetor. (See below). These are very difficult to find on original machines and even rarer in serviceable condition. Made from brass and chromed they had the following specification. On a Energic motoculteur B1, very rare. 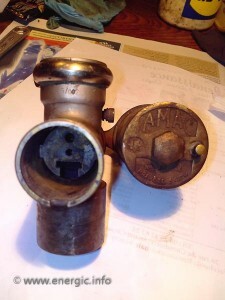 The early Energic motoculteur C7 B4L used a early AMAC type. 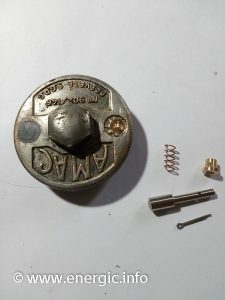 Which had a unbranded fuel float lid, center tickler (this is the spring operated priming button, you push 2/3 times to prime the carburetor). 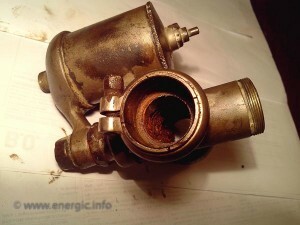 This carburetor, was left outside unprotected on the Energic motoculteur for many years, and suffered from water intrusion from the disintegration of the air filter. 2 feeds into top of the chamber operating the slide for air volume and quantity of fuel for the correct mixture. 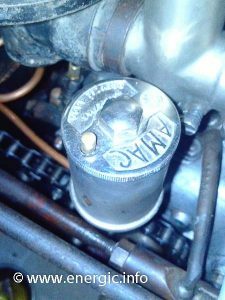 When the new S bloc engines became available in late 1934, the carburetor changed to the new AMAC T6 type 6/002 for both the C7 and D9 moteurs. They both used the same float weight, nosal diameters, and internal components. 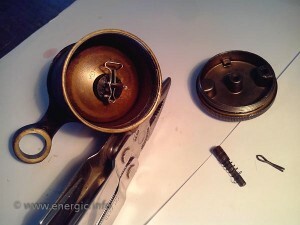 I have dismantled, cleaned and repaired many of these carburetors . 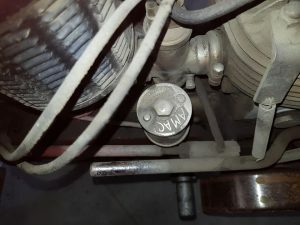 A lot of care is required in there disassembly and reassembly to make sure that your carburetor is in prime working condition. 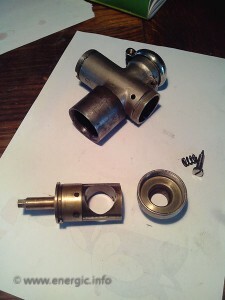 Here are some photos of the component parts within these carbs and some specification. 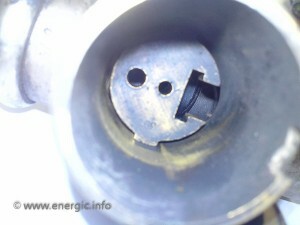 It is sometimes necessary to use the spare lug to drill a new hole to fit a new “tickler” system to be installed. 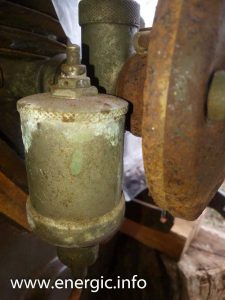 Often this is because the old hole supporting the spring of the ticker have broken or enlarged past the diameter of the ticker. Weld up or fill with metal hardener paste the old hole, then re drill with appropriated sized bits. 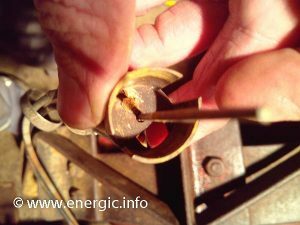 It is often better to drill using the unused lug as it will have more strength as in the case below. 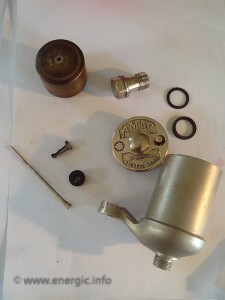 Energic AMAC Carburetor top re drilled and other side blanked off.